A large capacity mobile home ideal for large families or groups of friends, the La Combe+ model offers up to 8 beds. Very well arranged, its 32 m2 of surface area includes, in addition to the living/dining room, 3 separate bedrooms: the first with a double bed in 140, the second with two single beds side by side in 90, and the third with single beds in the trundle. 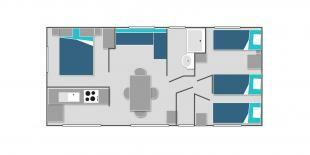 The accommodation also includes a bathroom with shower and basin unit, and toilets independent of the bathroom. The living room has been configured to isolate the kitchen area from the living room. 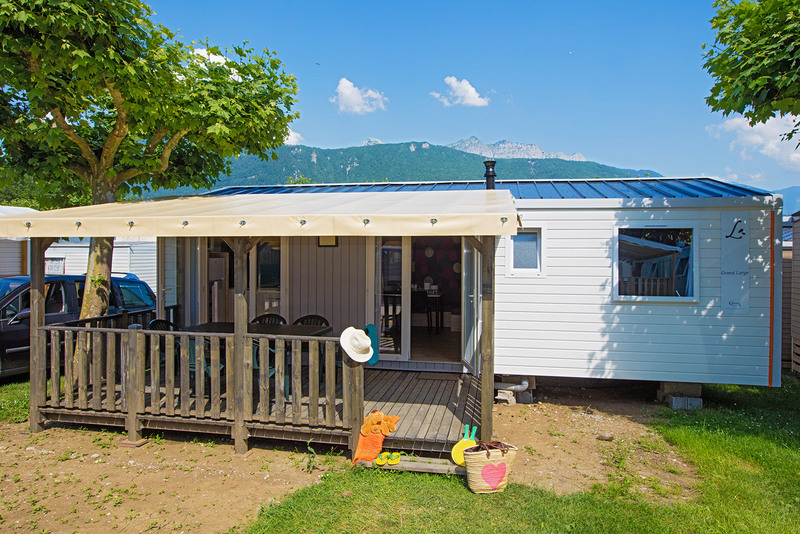 In the centre of the mobile home is a large room to gather, with a bench, television and a family table to enjoy meals in a friendly atmosphere. The kitchen area and the living room each open with a bay window onto the pleasant covered and elevated terrace.